LLWYN Y BRIG ISAF Trefor, self catering cottages with instant confirmed online booking. We have Self Catering throughout Gwynedd , Wales . Accommodation near all the attractions, places to see and things to do.......You are able to make an instant secure confirmed online booking. We also offer Gwynedd AND Wales travel and tourist information.. In an elevated position, 400ft above sea level, this 400-year-old detached cottage enjoys a dramatic backdrop of mountains and spectacular views over Caernarfon Bay. 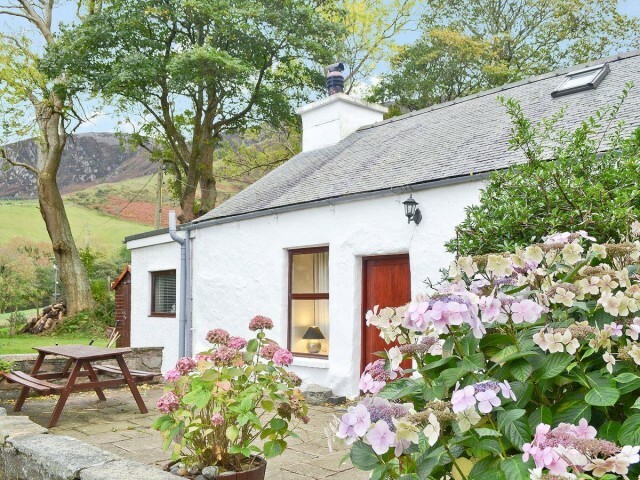 Lovingly restored and gently modernised, it offers not only peace and seclusion, but is also close to the rugged splendour of the Snowdonia National Park, fine sandy beaches, stunning mountain walks and the charming village of Trefor. There are two excellent beaches near the cottage. One is a gently sloping sandy harbour about 10 minutes’ walk through the village from the village shop, which is used by local fishermen to launch their boats. The other one is reached by walking towards the quarry past the local village pub and post office. It is a pebble beach which will stretch the most challenging beachcomber. In addition, the cottage is a short walk from one of the most famous Iron Age hill forts in Wales - Tre Ceiri, The Town of Giants, at the back of the cottage. The foundations and walls of the Iron Age huts are still remaining and the gold torques excavated from the ruins are on display at the National Museum of Wales. All in all, an ideal holiday retreat for families and weekend escapes throughout the year. Shop 2 miles.